With much care and thought, the owners, having decided to demolish the existing house on this large lot with its majestic mature oaks in front and a walnut grove out back in Mission Hills, Kansas, commissioned PWA to design this Spanish Colonial inspired residence, reminding them of their love of the La Jolla area of California. The house retains many of the characteristics of the style including its gated entryway forecourt, front logia, stucco and barrel tiled roofing, and arched openings. The “U” shaped house footprint was designed around a large rear open air courtyard. Interior details showcase terracotta and hardwood flooring, iron balustrades and railings and exposed-beam ceilings. 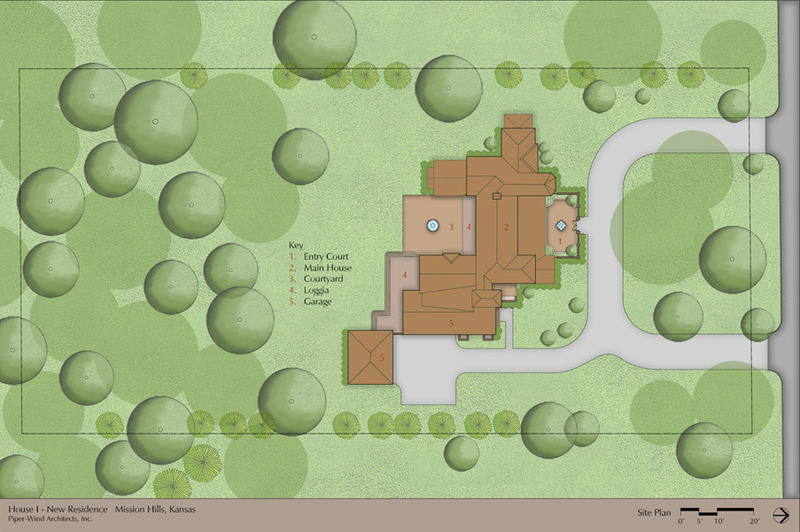 The design includes a first floor master suite, with an additional 3 bedrooms on the second floor.